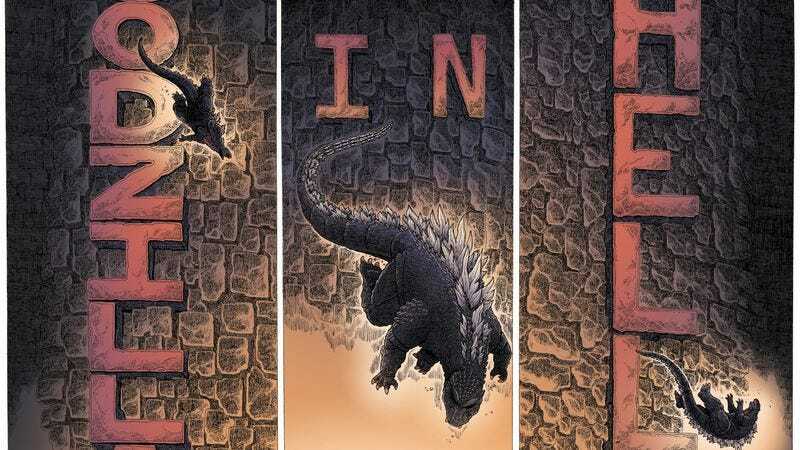 July 15th will see publisher IDW release the first issue of Godzilla In Hell, a new five-part miniseries that finds the king of monsters suddenly and mysteriously plunged into the netherworld. As he warily traverses through the fiery plains, Godzilla must fight off various unspeakable horrors while attempting to discover what has led to his damnation. As intriguing as the prospect of watching Godzilla journey through hell is, what makes this series even more exciting is the return of cartoonist James Stokoe (Orc Stain, Wonton Soup) to the title. Prior to his musclebound Hollywood comeback last year, Stokoe, who will be writing and illustrating the opening issue, penned one of the most memorable Godzilla stories in recent times with Godzilla: The Half Century War. A six-issue mini-series published in 2012 and available in a collected hardback edition this month, Half Century War follows a Japanese soldier, Ota, and his lifelong mission to get the better of his ferocious nemesis. Beginning when Godzilla first makes himself known to man, young Ota’s vow escalates to a globe-trotting, decades-spanning obsession in a world plagued by monsters of all kinds. Poignant and hugely entertaining, Stokoe lovingly payed homage the Godzilla mythos with his neon gradient colors and distinctive, stupefyingly intricate art. Three years later, Stokoe is back to oversee the beginning of Godzilla’s descent into hell, and as his Marvel 100th Anniversary Avengers #1 special issue showed last year, he’s more than capable of producing something exceptional in a single issue. The remainder of Godzilla’s journey will be documented by Bob Eggleton on both script and art in issue No. 2; Buster Moody will illustrate No. 3 as written by Ulises Farinas and Erick Freitas; Ibrahim Moustafa takes up art duties on the Brandon Seifert-penned issue No. 4, and Dave Wachter brings the series to a close in No. 5.